Aside from establishing a reputation as the cradle of Indian Athletics, Kerala has also produced quite a few high-profile cricketers. 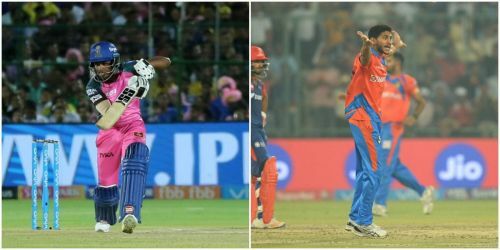 Following in the footsteps of Tinu Yohannan, the vibrant state has seen the likes of Shanthakumaran Sreesanth and Sanju Samson represent India since the turn of the millennium. Numerous cricketers from the Kerala setup have gained contracts with various franchises in the Indian Premier League (IPL). While Yohannan and Sandeep Warrier could not quite make their debuts for Royal Challengers Bangalore (RCB), here are seven homegrown Kerala cricketers who have played in the popular Twenty20 tournament. Named after batting icon Tendulkar, Sachin Baby is the current captain of Kerala across formats. His hard-hitting ability helped secure a contract with Rajasthan Royals in the 2013 IPL season. After being signed at his base price of INR 10 Lakhs, the left-hander played 11 matches for RCB during the 2016 season and scored 119 runs at a strike-rate of 150.63. Raiphi Vincent Gomez hit national headlines when he became only the second player from Kerala to earn an IPL contract. However, he did not get an opportunity to take the field for Rajasthan. In the 2011 season, he was picked up by Kochi Tuskers Kerala. From 11 matches, the all-rounder scored 46 runs and collected 5 wickets. Representing Kochi Tuskers in the 2011 edition, Padmanabhan Prashanth played only one match. The left-arm spinner gave away three sixes to Shane Watson in the lone over of his IPL career. From entering as a net bowler, Prashanth Parameswaran turned heads before breaking into Kochi Tuskers squad in the 2011 season. Following a remarkable debut wherein he grabbed the Player of the Match award, the left-arm seamer conceded 37 runs in an eventful over to Chris Gayle. Gujarat Lions signed Basil Thampi for INR 85 Lakhs in the 2017 season. The bustling right-arm pacer picked 11 wickets from 12 matches at an economy-rate of 9.49. Turning out for Sunrisers Hyderabad, he took part in just four games. Rising rapidly through age-group cricket, Sanju Samson made his first-class debut for Kerala in 2011. The talented right-hander's IPL debut came for Rajasthan Royals in the 2013 season. He has also represented Delhi Daredevils and Kolkata Knight Riders. Across six IPL seasons, he has amassed 1867 runs at a strike-rate of 127.35. If Yohannan is the trail-blazer, Sreesanth is the poster boy of Kerala cricket. In addition to his eventful international career, the maverick pacer also participated in 44 matches from five IPL seasons and picked 40 wickets. After making his debut in the inaugural season with Kings XI Punjab, Sreesanth appeared for Kochi Tuskers in 2011 and thereafter moved to Rajasthan Royals. Implicated in the spot-fixing scandal, his career came to an end during the 2013 season.